Join Susan G. Komen® Houston for its annual Race for the Cure® in Downtown Houston at 1000 Bagby on Saturday, January 27th. This year, we strive to be “More than Pink” and raise the necessary funds to save lives and get one step closer to ending breast cancer forever. 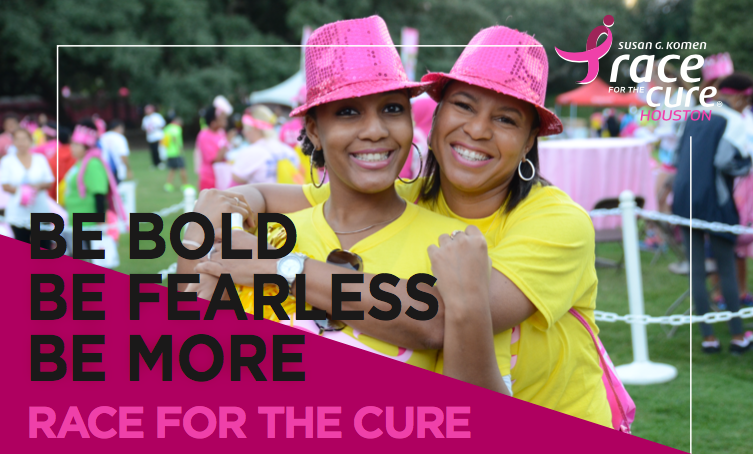 Join the Race for the Cure® by registering to run or walk in the 5K with your family and friends! Komen Houston has the bold goal to reduce the current number of breast cancer deaths by 50% in the U.S. by 2026 and they need your help, and your dollars. Participants are encouraged to start a team, fundraise, volunteer, become a corporate sponsor or community partner to help raise crucial funds for national breast cancer research and local community programs that offer education, screenings, treatment and support services to at-risk and under-insured Houstonians in need. For more information regarding Komen Houston, Race for the Cure® or any of its other events or programs, visit www.komen-houston.org.